- (CNN) - All five coalition service members who died in a helicopter crash in southern Afghanistan were Americans, a U.S. official said early Tuesday morning. Voters in Byron, Maine, have unanimously rejected a proposed law that would have required each household in the 140-person town to own a firearm and ammunition. Even the official who proposed the requirement, Selectwoman Anne Simmons-Edmunds, voted against it, saying she did so to have it reworked and reintroduced. At the intersection of the two country roads, charred debris lies strewn haphazardly. The earth around it is scorched for yards around. It is here, in this corner of Dumas, Texas, that a sports utility vehicle slammed into a gas tanker Sunday afternoon. The tanker's flammable cargo sent both vehicles up in flames, seriously injuring the truck driver and killing all five passengers in the Chevy SUV. All of those who perished were teenagers. The crash, coupled with another tragic one in Warren, Ohio, the same day, highlighted yet again how motor vehicle wrecks continue to be the number one killer of youths in the United States. New York City's planned ban on the sale of large sugary drinks won't go into effect Tuesday after a state judge blocked the restrictions, calling them "arbitrary and capricious." "The court finds that the regulation ... is laden with exceptions based on economic and political concerns," Justice Milton Tingling wrote. Mayor Michael Bloomberg quickly vowed to appeal the decision, countering that the city's health department has the legal authority to use the ban to fight an obesity epidemic. …Scheduled to begin at midnight, the law would have restricted the sale of sugary drinks to no more than 16 ounces in restaurants, fast-food eateries, movie theaters and stadiums. As entrepreneurs and venture capitalists swilled beer and swapped business cards at a technology conference in Austin, Texas, Kevin Callahan hunkered down March 9 for a closed-door meeting with Senator Jerry Moran. …Tech’s mounting interest in shaping public policy was on display at South by Southwest, where industry executives including AOL Inc. co-founder Steve Case and Tesla Motors Inc. Chief Executive Officer Elon Musk advocated for more cooperation between Washington and Silicon Valley. The sanity of James Holmes, the Aurora, Colorado, movie theater shooting suspect, may be a major issue at his arraignment Tuesday. In court documents, Holmes' attorneys have suggested that they may enter a plea of not guilty by reason of insanity for the shooting rampage at the theater that left 12 people dead and 58 injured on July 20. Patterns of "Likes" posted by people on Facebook FB +0.64% can unintentionally expose their political and religious views, drug use, divorce and sexual orientation, researchers said Monday. A study of 58,000 U.S. Facebook users, reported in the Proceedings of the National Academy of Sciences, arises from an emerging discipline in which experts sift through extremely large digital data sets, such as collections of web searches or Twitter messages, for subtle patterns and relationships. It highlights the power and risks of digital demographics, which are the key to targeted online advertising, experts said. A pair of states are proposing to use new Medicaid funding to help the poor buy private health insurance, a new twist in how to implement the 2010 federal health-care law that is winning support from some Republicans. Arkansas Gov. Mike Beebe, a Democrat, wants U.S. health regulators to let the state use federal dollars intended to expand eligibility for the Medicaid program to instead buy private insurance policies for low-income people. Ohio Republican Gov. John Kasich is pushing for a similar deal. The U.S. Treasury sold at least 17.2 million shares of stock in General Motors Co. in February as it vows to exit its stake in the Detroit automaker by March 2014. In a report to Congress late Monday, Treasury said it had raised $489.9 million from the sale of shares in GM last month. President Barack Obama held his first meeting with leaders of the Arab-American community on Monday to get feedback and ask questions one week before departing on a tour of the Middle East. Several participants characterized the off-the-record meeting as a complement to a similar one held with Jewish-American leaders last week, saying it was a chance for the president to talk with individuals deeply involved in the Israeli-Palestinian peace process and seek input on his first trip to the region as president. ALSO SEE: Jerusalem Post: Official says the PA president will place the issue of Palestinian prisoners held in Israeli prisons at the top of his agenda. Barack Obama will be limited to an especially strict Kosher diet when he visits Israel for the first time as US president this month. The stringent dietary restrictions will be dictated by the timing of Mr Obama's arrival at Jerusalem's landmark King David Hotel on March 20 – after it has changed to a full religious menu in preparation for the start of the annual Jewish Passover festival five days later. Bosses at the 233-room King David say they are unable to make an exception for the presidential party. President Barack Obama's latest effort to court GOP lawmakers through personal meetings may be grabbing headlines, but members of his own party say it's not just Republicans who deserve some face time with the commander-in-chief. Sen. Joe Manchin, the West Virginia Democrat who's one of the most conservative voices in his party, said Obama is just now beginning to forge personal relationships with Senate Democrats, despite having served in the chamber before being elected president. For all the attention to President Obama’s new campaign of outreach to Republicans, it was four months ago — on the eve of bipartisan budget talks — that he secretly invited five of them to the White House for a movie screening with the stars of “Lincoln,” the film about that president’s courtship of Congress to pass a significant measure. None accepted. …But now that he is trying harder — on Tuesday Mr. Obama makes the first of four visits to the Capitol over three consecutive days — Democrats say that his effort will put to the test, or at least expose, what they call the biggest factor of all: Republicans’ resistance to what overtures Mr. Obama does make, whether social or legislative, given the political danger of appearing too close to a president so unpopular with the conservative base. Rep. Marcia Fudge, chairwoman of the Congressional Black Caucus, expressed concern in a letter to President Barack Obama over the lack of African Americans among his new Cabinet picks. The president faced criticism at the beginning of the year when he picked white males for some of the highest spots in the administration, including secretary of state, treasury secretary, defense secretary and chief of staff (the latter of which has the status of Cabinet-rank). A key Senate committee unveiled legislation Monday to keep the government funded through the end of September while reducing the impact of $85 billion in forced spending cuts on a number of major federal programs. 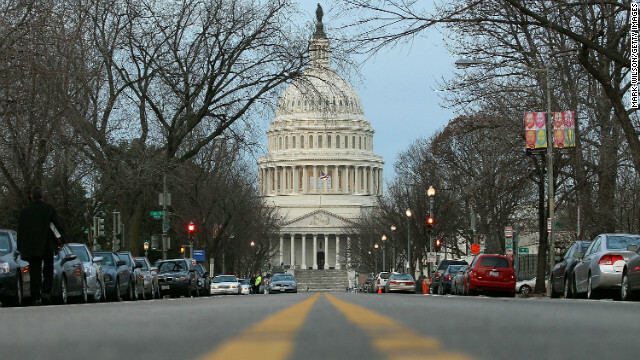 The full Democratic-controlled Senate is expected to vote on the Appropriations Committee's spending bill, known in Washington as a continuing resolution, before the end of the week. The measure builds on a bill passed by the Republican-run House of Representatives on March 6. Ahead of the release of his House GOP budget Tuesday, Rep. Paul Ryan previewed some of the plan’s key provisions, which he claims will lead to a balanced federal budget in a decade. "On Tuesday, we're introducing a budget that balances in 10 years – without raising taxes. How do we do it? We stop spending money the government doesn't have," Ryan wrote in an editorial published on the Wall Street Journal's website Monday. Savings would come from a series of measures that have long been backed by Republicans. One is a repeal of President Barack Obama's sweeping health care law, which continues to be implemented after being deemed constitutional by the U.S. Supreme Court last summer. Ryan's plan would replace the law with what he called "patient-centered reforms." Mary Jo White, U.S. President Barack Obama’s choice to run the Securities and Exchange Commission, may be compelled to provide more information about her ties to large banks as senators press her today about how she would operate as Wall Street’s regulator. Some Democrats on the Senate Banking Committee who will question White at a nomination hearing say their concerns probably don’t threaten her confirmation. White, 65, has said she would retire from New York-based Debevoise & Plimpton LLP, where she has served as a lawyer defending Wall Street, if she’s confirmed by the Senate. Dead people don’t need cell phones. That’s the message Rep. Tim Griffin of Arkansas wants to send Congress, after he says a controversial government-backed program that helps provide phones to low-income Americans ended up sending mobiles to the dead relatives of his constituents. Griffin has introduced a bill that targets the phone hand-out program, which has ballooned into a fiscal headache for the government. Whatever problems Congress has reaching agreement on the critical issues facing the country, it's not because they don't put in the hours. A study released today by the Congressional Management Foundation finds the typical member of Congress works 59 hours a week while in his or her district - and 70 hours when in Washington. The cost of winning a seat in Congress rose to a new all time high in the 2012 election cycle, according to a new analysis by MapLight.org of data from the Federal Elections Commission. The average price of winning or holding on to a six-year term in the U.S. Senate averaged $10,476,451 in the 2012 election cycle, MapLight said. Rep. Steve Pearce is the rarest of Republican Party officeholders, a very conservative Anglo who keeps winning elections from a predominantly Latino electorate. As the national GOP seeks to improve its dismal standing with Hispanic voters, the 65-year-old former oil man has some advice. "You just have to show up, all the time, everywhere," he said, during a recent barnstorm tour of his district, which sprawls across the southern half of this border state. "Most Republicans don't bother. I do. I bother." … Some party leaders are taking note of Mr. Pearce. The Republican National Committee has formed a committee to lay out a new election strategy, with South Carolina committeeman Glenn McCall in charge of reaching out to minority voters. Record numbers of women were elected to Congress last year, many of them Democrats bolstered by EMILY's List. Now, the Democratic women's group is turning its eye to executive positions ahead of the 2014 midterms, hoping to expand the thin ranks of Democratic women governors. Congress will remain a priority for the group, which recruits pro-choice Democratic women to run for office and supports them with campaign assistance, bundled donations from a two-million-strong member list, and independent TV and mail ads. But there is just one Democratic woman governor in office right now - Maggie Hassan of New Hampshire - and EMILY's List president Stephanie Schriock said in an interview that the group is looking forward to rectifying that in 2014. ALSO SEE: Politico: Next ‘war on women’ front: Pennsylvania governor race? Top national Democrats say it doesn't matter if Ashley Judd runs for Senate in Kentucky. Even without her Hollywood star and fundraising capability, they say taking out the Republican Senate Minority Leader Mitch McConnell is their "top priority." Democratic Senatorial Campaign Committee Executive Director Guy Cecil said Monday that Judd is one of "a handful of quality candidates in Kentucky" and "there's actually a deep bench." More than half-a-dozen potential Republican presidential candidates will be invited to court the party’s evangelical base at a conference hosted by the conservative Faith & Freedom Coalition this spring, the event’s chief organizer told POLITICO. The social conservative group intends to invite the biggest names in the 2016 field, including Florida Sen. Marco Rubio, Kentucky Sen. Rand Paul, Wisconsin Gov. Scott Walker, New Jersey Gov. Chris Christie and Virginia Gov. Bob McDonnell. Two South Carolina conservatives are preparing for possible primary challenges against Sen. Lindsey Graham (R), accusing him of being insufficiently conservative for the state. Nancy Mace, the first female graduate of The Citadel and a conservative blogger, told The Hill on Monday that she’s taking steps toward a possible run against the two-term senator. Bruce Carroll, a co-founder of the gay conservative group GOProud, is also examining the viability of a primary campaign. The Central Intelligence Agency is ramping up support to elite Iraqi antiterrorism units to better fight al Qaeda affiliates, amid alarm in Washington about spillover from the civil war in neighboring Syria, according to U.S. officials. The stepped-up mission expands a covert U.S. presence on the edges of the two-year-old Syrian conflict, at a time of American concerns about the growing power of extremists in the Syrian rebellion. Al Qaeda in Iraq, the terrorist network's affiliate in the country, has close ties to Syria-based Jabhat al Nusra, also known as the Nusra Front, an opposition militant group that has attacked government installations and controls territory in northern Syria. The State Department placed al Nusra on its list of foreign terror organizations in December, calling the group an alias for al Qaeda in Iraq. A military plane assigned to a Washington state Naval Air Station on Whidbey Island crashed on Monday morning during a routine training flight, killing all three crew members on board, Navy officials said. The plane, a Northrop Grumman EA-6B Prowler, a twin-engine electronic warfare aircraft, went down sometime before 8:45 a.m. local time in LincolnCounty in eastern Washington state, base spokesman Mike Welding said. Diplomatic tensions between the United States and Venezuela showed no signs of slowing Monday as the State Department announced that two Venezuelan diplomats had been expelled. Orlando Jose Montanez Olivares and Victor Camacaro Mata were declared personae non gratae and ordered to leave the country in response to the South American nation's decision to kick out two U.S. officials last week, State Department spokeswoman Victoria Nuland told reporters. The White House demanded Monday that the Chinese government stop the widespread theft of data from American computer networks and agree to “acceptable norms of behavior in cyberspace.” The demand, made in a speech by President Obama’s national security adviser, Tom Donilon, was the first public confrontation with China over cyberespionage and came two days after its foreign minister, Yang Jiechi, rejected a growing body of evidence that his country’s military was involved in cyberattacks on American corporations and some government agencies. At a time of national debate about women’s struggle to land top corporate jobs, an unlikely industry is leading the change in the executive suite: defense contractors, where three of the biggest firms are now led by women. General Dynamics, BAE Systems and Lockheed Martin have defied a long history of male-dominated culture and appointed female chief executives. But that new crop of leaders arrives as the industry faces destabilizing change involving the federal budget. Susan Rice lightly rebutted a Washington Post story that identified her as next in line for the job of National Security Advisor on Monday, saying that she is "happy" in her role as U.S. Ambassador to the U.N. "I am the U.S. Ambassador to the United Nations," Rice said at a panel at Joe's Pub, a small venue in downtown Manhattan where she was appearing with New Yorker editor David Remnick and writer Philip Gourevitch. "I'm going to continue happily serving in that role as long as the president wants me to." "What you read in the newspaper is not necessarily what is bound to happen," Rice said. "I'm not going to be guided by what is written or not written." The nation's aviation security chief is sticking to his decision to permit small knives on planes, despite increasing pressure to reverse course. There was immediate opposition from some pilots and flight attendants to the decision last week by Transportation Security Administration Administrator John Pistole. If President Barack Obama names Thomas E. Perez as his next secretary of Labor, Senate Republicans will have a lengthy and contentious Washington track record to examine as they decide whether, or how strongly, to object to his nomination. Perez, the assistant attorney general who heads the Justice Department’s Civil Rights Division, has served in that role since October 2009, when the Senate confirmed him on a bipartisan vote, 72-22. Since then, however, Perez has led the Obama administration’s notably aggressive prosecution of civil rights laws, frequently taking legal positions that have put him at odds with Republicans both in the states and in the halls of Congress. American Airlines and US Airways expect their merger to be officially sanctioned by fall. Then the hard part starts: making the marriage work. If previous U.S. airline mergers are any guide, the new partners may face some rough patches as they mesh booking systems, frequent-flier programs and eventually getting pilots familiar with new aircraft — all while persuading passengers to stick with them for the ride. Being the last pair of big network carriers to wed — after Delta and Northwest merged in 2008, and United and Continental in 2010 — the new American can take notes from the earlier mergers on what went right and what went wrong, and potentially avoid some of the same pitfalls. Attempted illegal gun purchases occur 30,000 to 40,000 times each year among U.S. firearms retailers, according to a first-of-its-kind survey of gun sellers published Monday. Would-be patrons seek to sway sellers to keep transactions off the books or, more commonly, use stand-ins — often girlfriends or wives — to fill out required legal forms and undergo federal criminal background checks necessary to purchase firearms, according to the survey by the Violence Prevention Research Program at the University of California-Davis. The Securities and Exchange Commission and the Illinois state government have reached a settlement over charges that the state defrauded investors by not giving them proper information about its pension funds. The SEC, which disclosed the charges with a filing Monday, said the fraud occurred between 2005 and 2009 when the state sold $2.2 billion in bonds without disclosing the impact of problems with its pension funding schedule. There were no fines or penalties against the state as part of the settlement. The U.S. Department of Veterans Affairs said it will not comply with the provision of New York's new gun control law requiring mental health providers to report potentially dangerous individuals to state authorities. The Secure Ammunition and Firearms Enforcement Act calls on doctors and therapists to alert county health officials to patients they deem "likely" to engage in conduct that will result in serious self-injury or harm to others. …Mark Ballesteros, spokesperson for the Department of Veterans Affairs, said in an email statement that "federal laws safeguarding the confidentiality of veterans' treatment records do not authorize VA mental health professionals to comply with this NY State law." A package of Democratic gun-control bills passed the Colorado Senate on Monday in an emotional debate that contrasted images of civil disobedience with dead children. The Senate passed five bills Monday — two House bills that must go back to the House, two Senate bills that must go to the House and a House bill that now goes to Gov. John Hickenlooper's desk. They tumbled to the sidewalk or ran for cover, scraping and kicking fruitlessly at the locked front door of an apartment building amid a spray of gunfire from two cars speeding down North Capitol Street early Monday. …In the end, 13 people were hit in the drive-by shooting Monday, nearly all of them grazed or struck in their arms or legs. One victim took a bullet to the lower back and was described as being in critical condition. Police said they had few answers to explain the shooting: no motive, no arrests, no information about a gun. It doesn't take long to see the effects of massive investment at the Connecticut factories that make the AR-15 military-style rifle. Deep in the heart of the sprawling Colt firearms plant in West Hartford, Bobby Craddock sets up rifle barrels in an enclosed, computerized lathe the size of a small car. …Elsewhere in Connecticut and in western Massachusetts, other firearms companies have also recently remade their production lines, hiring hundreds of new workers and spending a combined total of well over $50 million — at a time when old-line manufacturers in other industries are struggling just to keep the business they've got. The motivation behind the upgrades? The explosively growing civilian market for AR-15, military-style rifles. Asif Ali Zardari and Mahmoud Ahmadi-Nejad, presidents of Pakistan and Iran, on Monday formally launched a $1.5bn pipeline project designed to provide Iranian gas to the energy-starved consumers of Pakistan. In a live broadcast, Iran’s national television showed the two men shaking hands at an inauguration ceremony on the border, defying public warnings from the US State Department that the pipeline would “raise serious concerns” for violating US sanctions against Tehran over Iran’s nuclear programmes. The work to elect a successor to retired Pope Benedict XVI begins in earnest Tuesday, when the cardinals charged with the task gather in Vatican City for the papal conclave. Just a few hours after moving into Santa Marta, their residence at the Vatican for the duration of the process, the cardinals will start the day with a morning Mass at St. Peter's Basilica. The service - open to the public - will be the last public event featuring the 115 cardinals who will choose the new spiritual leader of the world's 1.2 billion Roman Catholics. WATCH: VIDEO – CNN's Ben Wedeman reports on the Church at a crossroads. The 80-year-old North Korean war vet says he's been holding onto a bullet he didn't get to fire when his country declared a truce with its neighbor 60 years ago. Now - if North Korean state media is to be believed - the man is itching to do so. "I am still keeping a bullet that I failed to fire at a trench in the 1950s because the U.S. imperialists and their stooges signed an armistice agreement," the man is quoted as saying in Rodong Sinmun, the official newspaper of the ruling Workers' Party. "Send me to the trench. Give me a rifle. I want to rain bullets on the enemy to my heart's content." WATCH: VIDEO – North Korea ratcheted tensions even higher when it said the armistice that ended the Korean war is null and void. Residents of the Falkland Islands voted overwhelmingly to remain a British Overseas Territory, an official said late Monday. The question put to voters was: "Do you wish the Falkland Islands to retain their current political status as an Overseas Territory of the United Kingdom?" The owner of the lone television network critical of the government in Venezuela said Monday he was coerced into selling the station by a hostile government. The development raised concerns that media freedoms will be further eroded as the politically polarized country prepares for presidential elections next month. At least 2,800 dead pigs have been fished from a Shanghai river since Friday, but authorities insist that tap water in the city is still safe to drink. State news agency Xinhua said labels tagged to the pigs' ears indicated they came from the upper waters of the HuangpuRiver, which flows through the center of Shanghai and is a source of the city's drinking water. Dissident Chinese artist Ai Weiwei, whose artwork is shown in museums around the world, is taking a different direction with his latest project - a heavy metal album. Ai wrote and sang each of the nine tracks on the debut album, which is called "Divina Commedia" after a poem by Italian poet Dante, and will be released next month. For three decades, the Federal Reserve has believed that the path to economic prosperity is in fighting inflation. But it is realizing that is no longer enough. The central bank for the first time is making an attempt to shape the labor market, believing that reducing unemployment is the key to the recovery. It has tied billions of dollars of stimulus money to the health of the labor market. It has vowed to keep interest rates at historic lows until the unemployment rate is at least 6.5 percent. Top officials have begun addressing the issue in increasingly urgent and personal tones. General Electric nominated Mary Schapiro to its board of directors, the company said Monday. Schapiro was chairman of the top regulator of the financial industry, the Securities and Exchange Commission, until December. "Her understanding of corporate governance and financial regulation will be of great benefit to GE and its shareowners," said GE (GE, Fortune 500) CEO Jeff Immelt in a statement. The U.K. Serious Fraud Office has opened an investigation into allegations of wrongdoing by managers at Autonomy Corp., the software maker acquired and later written down by Hewlett-Packard Co. (HPQ) The SFO informed Hewlett-Packard of the investigation Feb. 6, and follows the U.S. Justice Department in probing Autonomy, Palo Alto, California-based Hewlett-Packard said in a filing (HPQ) yesterday with the U.S. Securities and Exchange Commission. Glad to see that people in Maine brains are not completely frozen. What did Rodman do or say when he visited North Korea? I thought it was just a publicity stunt for the guy with the bad hair silly show (I think I just answered my own question, neve rmind).